Work-structure Rows 1-3 present the work as gesture-model configurations and topologies, pointing at tectonic-moves, body-moves and site-program issues. A, surfaces and openings forming/formed by sunlight-movement east-west, the light taken in from below and above. The surfaces initiate ‘bones’ that raise the space from within. B, bone articulates passages transversely, condensing arounds vertical joints. Facing west, bone and differentiated openings interchange with local spaces set by the context. 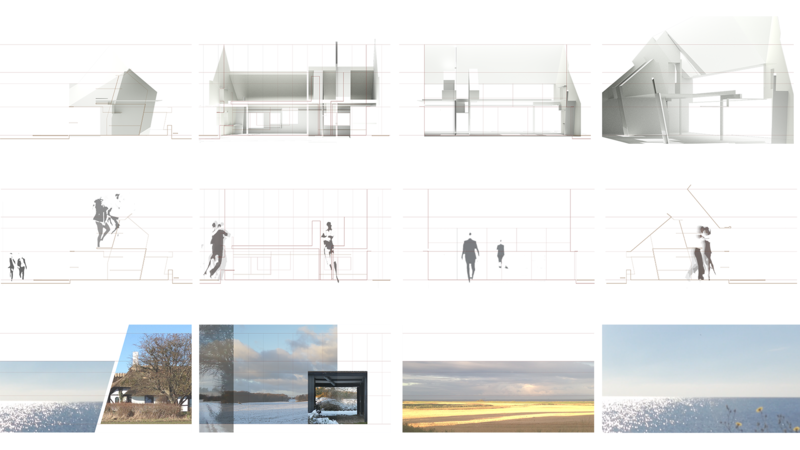 C, facing east, inside and outside, foreground and background, dissolve in the open horizon. D, surface-gestures articulate spatial atmospheric turnings and stretched intervals. A, movement figures stretch out below and above, involving east and west differently. B, movement figures pulsate and juxtapose locally shifting western spacing and dragging. C, movement figures expand the local western and open eastern orientation. D, movement figures turn and coil along and across. A, facing east: open horizon, facing west: timber frame houses that prohibit evening light. This relation set a diagram for the stretch of the new space, together with orientation of apertures at east low at west high. B, facing west, partly against shared court and entry. The relation set diagrams for scaling the new space, with differentiated western thresholds and views. C, facing east, against coastline and landscape-width. The relation setup a diagram for scaling the new space, with eastern orientation openly exposed. D, crossing interchanges with existing buildings, the relation set a diagram for meeting scales and contours of the site – and concurrently twist the whole atmosphere of the new.